The pure rotational and high-resolution acetylenic C–H stretch rovibrational spectra of a series of substituted butynes, HCCCH2CH2X (X=F,Cl,Br), are reported. For each of the molecules the pure rotational spectrum of two conformational isomers (trans and gauche) has been assigned. For the Cl and Br substituted compounds the pure rotational spectrum of two isotopic species has been assigned (35Cl, 37Cl and 79Br, 81Br) for each conformer. An analysis of the nuclear quadrupole hyperfine structure in the pure rotational spectrum shows good agreement with structural parameters obtained through electronic structure calculations. The rotational transitions are used to obtain full rotational assignment of the acetylenic C–H stretch vibrational band of the more stable trans conformers through infrared-microwave double-resonance spectroscopy. The rotational band contours are predominantly a-type for all three halobutynes. The rotational structure of the band displays separations characteristic of the trans conformer. This result reflects the fact that the bright state for the vibrational spectrum retains the ground state conformation. From the eigenstate-resolved spectra we determine the timescale for intramolecular vibrational energy redistribution (IVR). The IVR rate obtained from the high-resolution spectrum provides an upper limit to the isomerization rate following coherent vibrational excitation. The IVR lifetimes of the acetylenic C–H stretch have been determined to be 1.5 ns for trans-4-fluorobut-1-yne, 3.5 ns for trans-4-chlorobut-1-yne, and 2.0 ns for trans-4-bromobut-1-yne. In all cases, the upper limit isomerization rate inferred from the vibrational spectrum is three orders-of-magnitude slower than the RRKM rate calculated using the ab initio barrier heights. 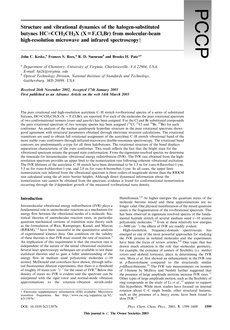 Although direct dynamical information about the isomerization rate cannot be obtained from the spectrum, evidence is found for conformational isomerization occurring through the J-dependent growth of the measured rovibrational state density.